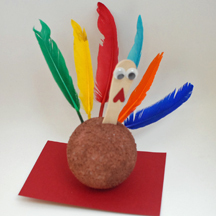 These cute turkeys can double as Thanksgiving place cards! What You Need: Styrofoam ball; brown tempera paint; feathers (with stiff quills; they’re a little more expensive); wooden “spoon” (sold in the craft aisle, or with your ice cream); 2 googly eyes; red cardstock; office brad; paint brush; scissors; glue. How You Make It: Paint turkey brown. (Note: It takes awhile to dry. Try setting it on a cup and rotating it from time to time.) Glue googly eyes to top of spoon. Cut wattle from red cardstock (we used a heart-shaped punch) and glue below eyes. Poke spoon “head” into ball about one-third of the way. Poke feathers into styrofoam for plume. You can use an office brad to attach the Styrofoam ball to a piece of cardstock; then write a guest’s name on the cardstock. If you’d rather, an adult can cut off the bottom of the ball so the turkey can sit on its own. This entry was posted on Tuesday, November 13th, 2007 at 10:31 am	and is filed under Styrofoam crafts, Thanksgiving crafts. You can follow any responses to this entry through the RSS 2.0 feed. Responses are currently closed, but you can trackback from your own site.